The lowest average wholesale marijuana price ever recorded by Cannabis Benchmarks came this year in Colorado, according to the market-research firm’s 2017 mid-year report. Cannabis Benchmarks has been tracking sales of the new commodity across the U.S., much like other market-research firms do for corn, wheat or soybean, and publishing a weekly wholesale price index, in addition to two comprehensive reports annually since April 2015. The company does this by compiling data on wholesale prices, the size of transactions and volume-weighted averages, further breaking the numbers down by the type of grow — outdoor, greenhouse or indoor — and offering state-by-state analyses. “To my knowledge, we are the only company that is wholly focused on the wholesale side of the market in this manner,” said Adam Koh, Cannabis Benchmark’s editorial director. “We don’t publish anything we’re not prepared to stand behind,” he added, later explaining the company is currently working on regular market reports for other marijuana products, like extracts and edibles, but isn’t quite ready yet. Currently, Cannabis Benchmarks only reports on marijuana flower. And according to the company’s 2017 mid-year report, there’s been a downward trend in wholesale prices across the country and a much more dramatic decline in Colorado throughout the first half of 2017. Additionally, the market is expected to stay relatively stable through the rest of 2017, remaining far below previously seen highs and signifying “a new reality” for growers, processors and retailers alike. The 2017 mid-year report, released earlier this month, is available for $229, but the company made the 65-page document, complete with graphics, market-force analyses and predictions for what’s to come, available to the Summit Daily free of charge. In many ways, Colorado stands as an outlier in the marijuana industry, and the first state to legalize recreational use for adults can now boast having the most mature marijuana market in the country. When it comes to wholesale prices, the lowest average weekly state-level price ever recorded by Cannabis Benchmarks — $1,181 per pound — came in the first half of 2017 in the Mile High State. Coming into 2016, Colorado’s wholesale prices were the highest among what the company has dubbed the “Big 4” — California, Colorado, Oregon and Washington — but that has since changed. 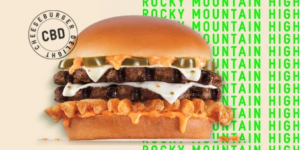 The report attributes the falling prices in Colorado — now below that seen in any other state — largely to increased supply, fierce competition and the state’s comparatively lax regulatory framework. As a result, prices have been trending downward for the last year and a half after absolutely crashing in July 2016. “In the 12 months from July 1, 2016, through June 30 of this year, Colorado’s pot price has plunged by just over 40 percent,” according to the report, sliding from $1,994 per pound to the aforementioned all-time low of $1,181. Additionally, Colorado has experienced the most dramatic year-over-year decline and the most significant drop in volume-weighted average for any state with a legal cannabis market. This might come as good news to retailers and consumers, but indoor growers have been hit especially hard and “have seen their product’s value tank severely,” dropping 37 percent in this year’s six-month average compared to the same span a year ago. Meanwhile, pricing for greenhouse flower has fared a little bit better, but remains down, as well. Outdoor grows in Colorado are largely omitted from the report, as much of their production is focused on “trim,” which often sells for around $400 a pound, rather than flower, according to Cannabis Benchmarks. 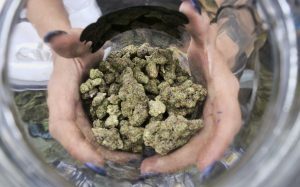 “Year-over-year comparisons between (the first and second quarters) of 2016 and the same periods this year drive home just how much Colorado’s wholesale cannabis prices have declined — and continue to do so — as a result of drastic increases in production capacity allowed by the state’s liberal approach to licensing and production,” the report states. Beto Chanez trims leaves off marijuana plants at the Pot Zero grow facility Friday, Sept. 22, in Gypsum. The plants are flowering and workers are getting ready to harvest the flowering buds of the plant. As detailed by Cannabis Benchmarks’ mid-year report, the 2016 November election may have “ushered in the Trump regime” and “anti-cannabis zealot Jeff Sessions” for U.S attorney general, but the election also saw voters in four states approve recreational pot, adding California, Nevada, Massachusetts and Maine to the small list of states that already allow adult-recreational use, namely Colorado, Oregon and Washington. While uncertainties have plagued the market since legalization took hold — first in Colorado in January 2014 and seven months later in Washington — the report shows a maturing market across the country with retailers learning from pervious years and considerably more stability than what the industry saw in the first half of 2016. Overall, the falling prices may not be an encouraging sign for growers, whose profit margins can best be described as “thin,” but Koh notes that while his company doesn’t track retail prices, he’s seen some of those savings ultimately being passed on to consumers. States that allow medical marijuana sales have considerably higher wholesale prices than states permitting recreational use. Also, it appears retailers and wholesalers are keeping their transactions small, with the average deal in Oregon being for 2.6 pounds at the low end and 17 pounds in Washington at the high end. The report notes that because there’s a patchwork of mixed enforcement across the U.S. and because marijuana remains illegal at the federal level, few wholesalers, especially those in newer markets, want to make large-scale transactions. Also, with the cash nature of the business, where retailers often pay for the pot they sell in cash, retailers aren’t getting the kind of discounts they might see if they bought in bulk. In Colorado, for example, the average deal is for 5.8 pounds, slightly below the national average. According to Cannabis Benchmarks, retailers can save about 12 percent buying 5 pounds at a time, almost 18 percent if they buy 10 pounds and up to 40 percent for deals of 200 pounds. However, less than 2 percent of all deals across the U.S. were for more than 75 pounds, with 46 percent of transactions being in the 1-5 pound range. Marijuana plants are beginning to flower at the Pot Zero grow facility Friday, Sept. 22, in Gypsum. The wholesale price of marijuana in the U.S. is expected to bottom out in November but before it reaches the lows seen in 2016. A flood of seasonal marijuana from outdoor grows is expected to push prices down akin to what happened in 2015 and 2016 with the fall harvest entering the market. 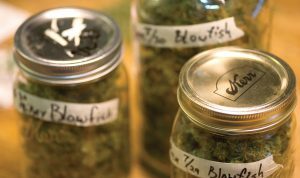 One of the biggest influences will be California’s transition into recreational sales. According to the report, the event “will be incredibly turbulent, with various contradictory possibilities for wholesale pricing that we expect to play out simultaneously” and that uncertainty will “weigh heavily” on the national price index. 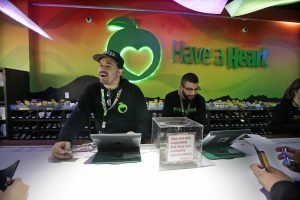 At the same time, this month marks one full year for recreational sales in Oregon, which has been plagued by “unpredictable growing pains” throughout its first year of recreational sales. Other states, like Washington, have seen their governors and state attorneys general issue statements saying they would defend their statewide cannabis laws if Sessions were to move on legalized marijuana markets. Koh also said that as these markets continue to advance, another big step will come in the form of hedging and derivatives, allowing companies to better manage the wholesale price risk.